Shoplifters Review | We’re lucky someone like Kore-eda makes movies. "Kore-eda’s calling card is his sublime sense of humanism and his focus on the dynamics of the family. " "Kore-eda is no wide-eyed idealist, but he has an uncommon ability to draw out the humanity in his characters, even or perhaps especially when they are seriously flawed. " MIFF is perfectly timed to receive all the richest runoff from the Cannes Film Festival, and this year that includes the winner of the 2018 Palme d’Or, Hirokazu Kore-eda’s Shoplifters. The prolific Japanese director is no stranger to MIFF or Cannes, as his 2013 film Like Father, Like Son won the Jury Prize at Cannes and his 2016 film After the Storm played MIFF. He’s also squeezed in two other features in those short five years. Kore-eda’s calling card is his sublime sense of humanism and his focus on the dynamics of the family. Both of these have earned him comparisons to the Japanese master Yasujiro Ozu, and the quality of his work has done nothing to lessen the likelihood of such comparisons. 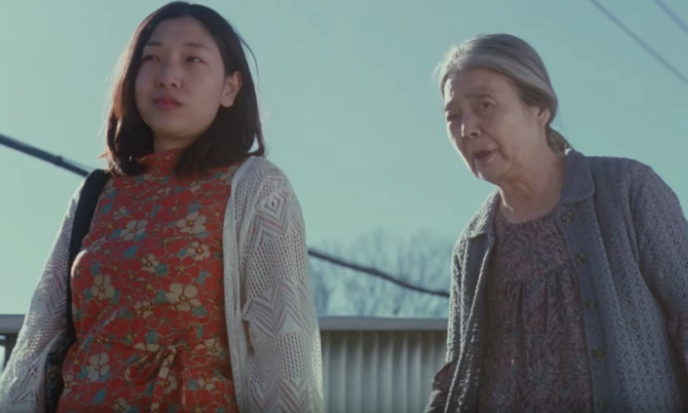 Shoplifters is no exception on either front, with one small variation: It focuses not on a biological family, but one who has chosen each other. On the surface, the six central characters resemble any traditional family: A grandmother, a man and woman who could be her son/daughter and his/her spouse, a younger woman who might be their younger sibling or an older granddaughter, and two young grandchildren. In reality, these are six strangers forming a makeshift family unit, living in a glorified shanty, born of a variety of circumstances that leave them at the poverty line. They supplement their scant income by liberating loose vegetables, noodles and other foodstuffs from local stores, a scam mostly pulled off by the kids. They start with just one kid, but are attracted to another when they find her shivering on a cold winter’s night. They take her home and feed her, and upon attempting to return her home, overhear her abusive parents arguing about wishing they’d never had her. The only humane thing seems to be to integrate her into their little clan, a decision that both enriches that clan and threatens to expose secrets that none of them can afford to have revealed. Kore-eda is no wide-eyed idealist, but he has an uncommon ability to draw out the humanity in his characters, even or perhaps especially when they are seriously flawed. Most moments in a Kore-eda movie are small moments, but they invariably have the elegiac quality of an artist with an inherent sense of grace. Dozens of small moments in Shoplifters ooze this kind of beauty, whether it’s two kids shining a torch through the translucent marble that comes from the bottom of a drink bottle, an old woman sewing while a younger woman rests her head in her lap, or a spontaneous romantic tryst on a rainy afternoon. Kore-eda is precious without being precious. That is to say that he doesn’t falsely drum up his emotional truths, but finds them emanating naturally out of the understated moments he writes, without drawing attention to them. These moments develop a precious quality because they remind us how rare his type of delicate touch is. His work is informed by an optimism that people will do the right thing, rather than the wrong thing, when given the opportunity. However, neither is his perspective naïve. The standout in an impressive cast is Sakura Ando as the woman who usually goes by “Auntie,” as these people don’t necessarily even know each others’ real names. It’s her maternal relationship with the young girl, Juri (Miyu Sasaki), that gives the film a good deal of its poignancy, though there are similar relationships between others in the group, including the man (Lily Franky) and the boy (Kairi Jo). When contrasted with the “real” family who neglects and actually abuses young Juri, the chosen relationships of this ersatz family seem idealised – even if they are based on lies and thefts, and ultimately unsustainable. The notoriously eccentric Cannes Film Festival does not always choose wisely when doling out its awards, but Shoplifters does the jury proud. We’re lucky we have someone like Kore-eda making movies today, as he gives us his uncommon sensibilities with generous regularity.